In an exclusive and revealing video interview, internationally-renowned scholar and author Norman Finkelstein talks to Ceasefire editor-in-chief Hicham Yezza about life, politics and peace in the Middle East. “I have not watched TV since…” says Norman Finkelstein, pausing for a half-second, “… 1972”. We happened to be on the way to the swimming pool (Finkelstein never misses his two-hour daily swim, regardless of where he is in the world) and, having watched him up-close on a number of visits, something obvious occurs to me: whether it’s a lifestyle choice or a political issue, when Norman Finkelstein believes in something, he gives it everything. And it is precisely this dogged single-mindedness that many of his detractors, and some of his supporters too, find so unnerving. One Zionist activist, upon hearing him speak in 2008, told me afterwards “he is a first-rate scholar and clearly a very clever man … but I wish he wouldn’t be so … polemical”. By “polemical” he meant that Finkelstein does not take the trouble, as many in academia do, to pretend he has no opinions of his own. For their part, some of his supporters feel he often puts himself at risk in situations where he, perhaps, should have been more pragmatic and less naive (“Was I naive?” he ponders rhetorically in our interview). Norman Finkelstein is one of the world’s leading scholars of the Palestine-Israel conflict. His books are sold, and read, around the world; translated into dozens of languages. Tickets for his UK tour, which concluded on Friday, were heavily oversubscribed. His final event, in London’s Logan Hall, was also a sold-out thousand-seater affair. This is certainly not because of a presentational “style” or gimmicky showmanship: his delivery borders on the metronomic; his talks average just short of two full hours. Clearly, people still want to hear what he has to say. And yet, especially for the past four years or so, he’s been treated, in his own words, as “something of a pariah”. In 2007, he was forced out (he had not “left”, as I had incautiously phrased it) of DePaul University in Chicago, where he had been teaching for 8 years, after the university declined to grant him tenure. The decision came at the end of a ferocious campaign of vilification and intimidation, targeted at Finkelstein and also DePaul, largely orchestrated by Alan Dershowitz, Harvard law professor and Israel’s semi-official cheerleader-in-chief in the US. Born in 1953 in New York, his parents had both survived the Nazi concentration camps. The rest of his family was exterminated in the Holocaust; a defining, guiding experience throughout his life. He came to prominence in the 1980s, while doing his doctorate at Princeton, when his meticulous demolition job of Joan Peters’ From Time Immemorial was pivotal in turning what had initially been effusive reception of the book to a definitive, and quasi universal, dismissal of it as fraudulent and mere propaganda. His own book “The Holocaust Industry,” published in 2000, though vehemently attacked by many, nonetheless led to serious questions being raised and a respectful reception in the UK. A major turning point was his 2003 debate, on Democracy Now, with Dershowitz, on the subject of the latter’s recently published The Case for Israel. Finkelstein took no prisoners, accusing Dershowitz of being a plagiarist and, to the latter’s fury, raising doubts about his authorship, memorably telling the Harvard professor “I hope for your sake that you didn’t write this book”. If Finkelstein wanted to provoke a reaction, he certainly won that bet. Ever since that debate, Dershowitz has seemingly been obsessessed with trying to, in effect, destroy Finkelstein’s career and reputation. 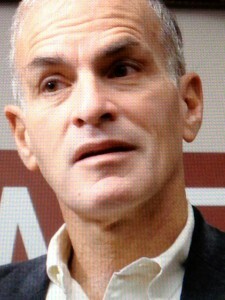 Not only was Finkelstein’s bid for tenure fatally compromised by Dershowitz’s campaign (including the compilation of a 500-page dossier of mostly personal attacks,) but Finkelstein has found himself effectively blacklisted on the US academic circuit, sometime being invited to deliver a talk only to see his invitation rescinded under pressure from his enemies. As he makes clear in our interview, the ferocity and venom of the attacks against him have been extraordinary. Last week, upon arriving at Birmingham University to deliver another talk, Finkelstein is informed that a crowd of Zionist campaigners awaited him at the entrance to the lecture hall. Approaching the building, a crowd is indeed assembled around the entrance, shouting slogans in the rain. The words aren’t clear, though the vehemence certainly is. “No” Finkelstein responded without hesitation, striding purposefully towards the doors, and the chanting mob. « Previous: North African Dispatches | (Arab) Woman’s Hour? He is a legend. Shame on Alan Dershowitz, Harvard University and any one anti- Dr. Norman Finkelstein. Finkelstein is a man of fairness, balance and honour — and that is very very rare these days. He also has a lot of soul. The interview is excellent — we really get insight into him as a person, and understand him more. Very very good. One of the best interviews with the man I have seen. Got to respect the man’s total attention to detail too — he says he is a ‘forensic scholar’ — that’s about right !